Order back issues online, by mail or by phone. Call during office hours (603) 624-1442.
please include your name, signature, full mailing address, and phone number with your check or credit card information (number and expiration date), as well as the specific back issues you are ordering. Order each issue below by checking the box next to that issue. • Why is autism on the rise? • Best Towns – The perfect place to buy a home for young couples, families, empty nesters or free spirits who want to get off the grid… and we help you find the perfect pooch too! • 25 restaurant dishes you will love! • How Safe Are You? A Town-by-Town Look at Crime Zones, Catastrophes, Hazardous Highways, Dangers in the Drinking Water, Terrorist Targets and Alien Abductions – All Right Here in the Sleepy Granite State. • Who Won our Granite Chef competition? • Is Cancer in Your Genes? • Are We Prepared for the Bird Flu? 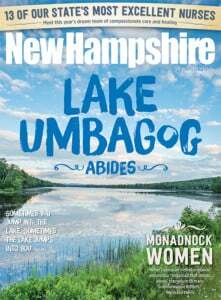 Note: If you would like to order a back issue prior to 2005, please call (603) 624-1442. Want to subscribe? Click here.